Will Lowe's Blogtails: Cow Vodka. Really. Many of those who know me will be very surprised to see me writing a blog about vodka. For those who don't know me, allow me to briefly surmise: vodka is excellent. For cleaning things. Before the Russian Mafia arrive at my door I would like to qualify that I restrict this rather disparaging opinion to those Western vodka brands whose only aims are the pursuit of flavour neutrality and the PR goal of being photographed along side a vacuous minor celebrity, both of which strike me as entirely pointless endeavours. Nonetheless, here I am writing a blog about vodka. What, you may ask, has convinced me to do so? Frankly, the fact that the story behind this one is so bizarre is simply had to share it. This vodka is made from ... Milk. Yep. "The milk is separated into curds and whey. 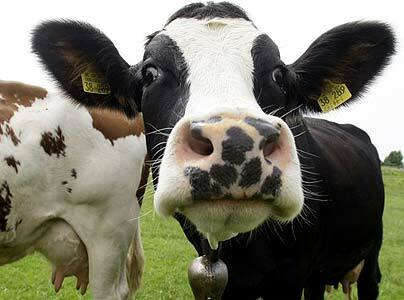 The curds are used to make cheese, the whey is fermented into a beer using a special yeast that converts the milk sugar into alcohol"
After this, a simple distillation and triple-filter process later we have vodka. Having spent very little time under a cow I'm not best placed to comment on the logistics here, so I'll stick to what I know: tasting. To cut to the chase (please excuse the unintentional vodka pun), is this vodka any good? In short, yes. It has a well rounded, full-bodied structure and a restrained anise note - somewhat like a blend between a potato and rye grain vodka. On the downside (for me, probably the upside for vodka fans) it has a fast, clean finish. I'm sure there are far better reviews for this product floating around the internet: given my stance on the category it is predictable that I should refrain from hurling superlatives at any vodka. 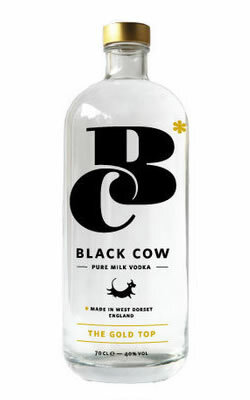 Whether Black Cow vodka will take off remains to be seen, but I would like to whole-heartedly congratulate the team behind it for such an innovative approach and wish them every success with this truly bizarre venture. *NB I would like it noted that I managed that whole post without a single reference to the vodka being particularly 'sMOOth', a 'pull the udder one' pun, or any of that kind of bullocks. You herd it here first. Thank you!